After I mow my yard, my shoes are just covered in grass clippings. 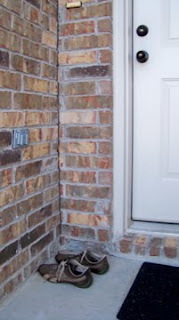 The other day I decided to spare my house the mess (I do, after all, spend my days removing grass, sand and other outdoor debris from the entries) and left the shoes outside my front door. Always check your shoes for scorpions before putting them on. I picked up the first shoe and shook it out. Other than a few grass clippings floating to the ground, nothing came out. I looked inside. Nothing. Just to be sure, I pulled up the tongue and peered way down into the toe. A very surprised toad blinked at me. In my own surprise, I shrieked and threw the shoe. Then I recovered and started laughing. 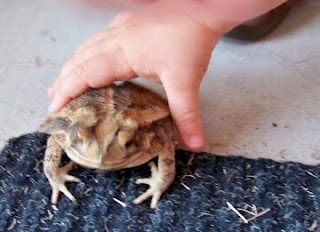 I retrieved the shoe, said hello to the toad, and pulled him out. He was HUGE! I do not know how he snuggled himself down into the toe, but he nearly filled the whole thing. How on earth did I not feel his weight when I picked up the shoe? How did I not see him on first or even second look? I imagined the exchange from his point of view. The dude has been out catching flies all night under my porch light. The light goes out at 4am, the bugs go away, and he looks around for a place to spend the hot Texas summer day. He spots the shoe, tries it on, decides it is a nice fit. He goes to sleep, feeling safe. Suddenly, an earthquake hits! With no warning at all, he is violently shaken to and fro. A moment later, a pair of giant eyes peers at him, followed immediately by a loud noise. His house sails through the air, stopping abruptly as it hits the ground. The thing with the giant eyes pulls him out and shows him to its young. Hands, hands everywhere. Finally he pees on a hand, gets dropped to the pavement, and hops to safety under the nearby jasmine bush. Whew! Disaster averted! After we had a good chuckle about the surprised toad in my shoe, someone thought to ask, what's in your other shoe? I don't know! Let's find out. To our continued amusement, there was another, slightly smaller (but less surprised) toad, braced way down in the toe of the second shoe. What a trip! We pulled him out, admired him, and placed him under the jasmine bush where the first toad had gone. Just for fun, I left my shoes outside again after mowing. We have found at least one toad in my shoes every night this week. Who knew stinky, grassy, leathery shoes would be so attractive to our clammy, bug-eating friends? 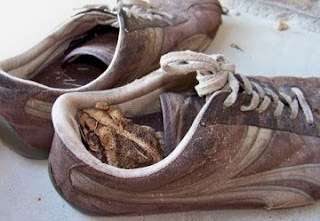 The nice thing about finding toads in your shoes is that you don't have to worry about scorpions.